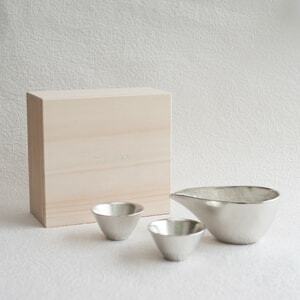 Sake sets or sake cups of Nousaku are made of tin. Tin sake set makes sake delicious. 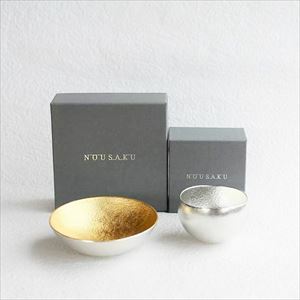 For more elegant sake time, or gifts for sake lovers, Nousaku sake sets have been popular items. Sake sets of Nousaku are famous for its special effect. 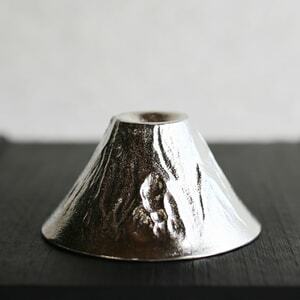 The sake cups and sake sets of Nousaku are made of tin. 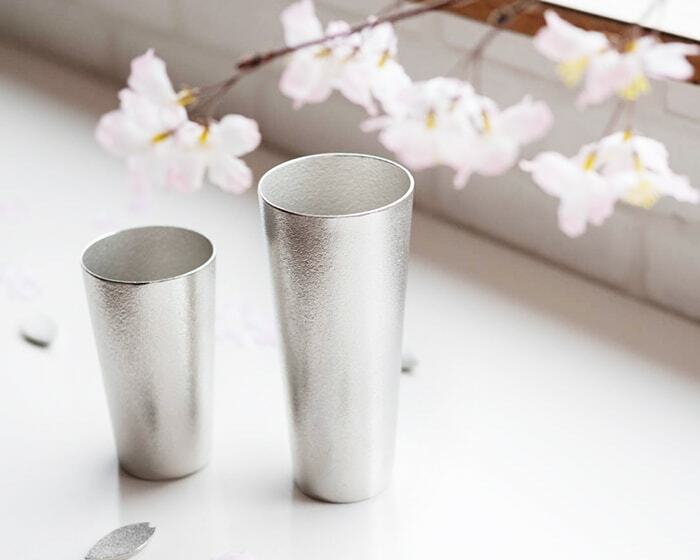 Tin sake cups can make sake delicious! 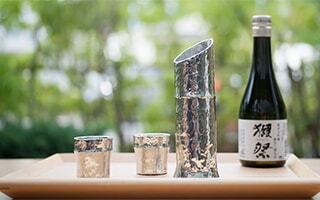 Have you ever tried the sake with tin sake sets? If you are sake lover, you should try it. We understand your feelings. 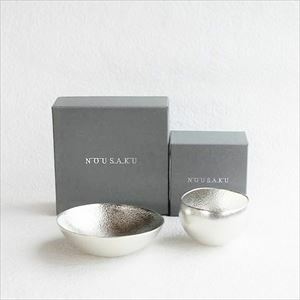 What is the secret of Nousaku sake set? 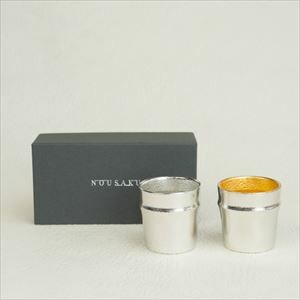 For all alcohol lover in the world, we would like to introduce the special item, Nousaku sake cups and sake sets. 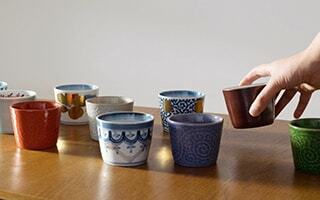 The choice of sake cups changes the taste of sake. It is difficult to believe. 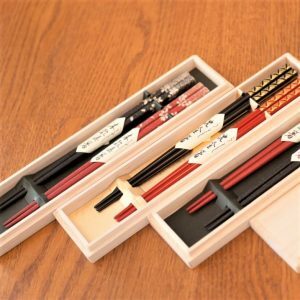 Why tin sake sets make it possible? Tin has high ionization effect, antibacterial effect, and keeping freshness. 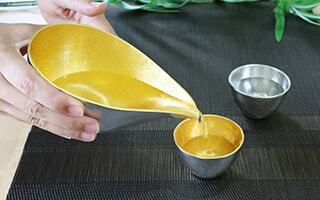 It is said that “the water in a tin ware does not rot,” or “a tin ware softens the taste of sake.” Therefore, people have used tin as a sake set or tea cup. Scientifically, the relationship between tin and fusel oil is the secret of how to soften the taste of sake. The fusel oil is a volatile component which is generated during the brewing of alcohol. It is said that the fusel oil is especially contained in Japanese sake and wine. In fact, tin has an effect to dissolve the fusel oil. So, the Japanese sake taste becomes mild by the tin especially when the sake is dry. Furthermore, the tin hardly has metal-specific smell. 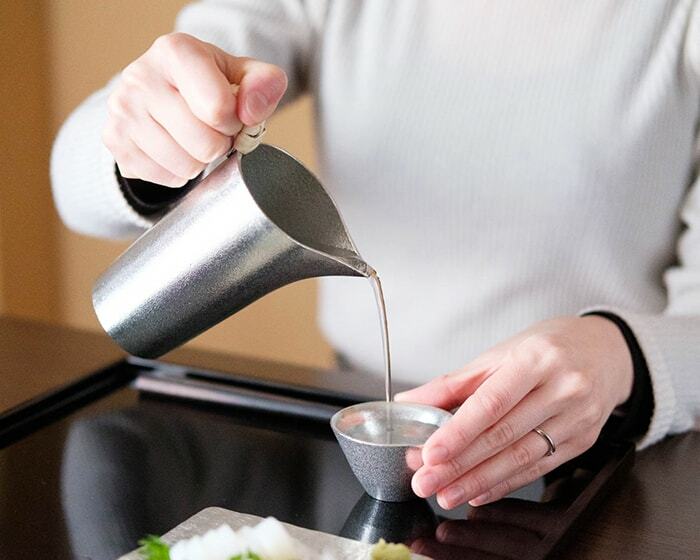 The tin sake set does not interrupt the delicate taste or aroma of sake. This is the secret of Nousaku sake set. The effect of tin sake cups is proved scientifically. Now, you know the reason why sake sets of Nousaku have been popular by alcohol lovers. Tin is the third expensive metal after gold and silver. People have used tin since about B.C. 1500. 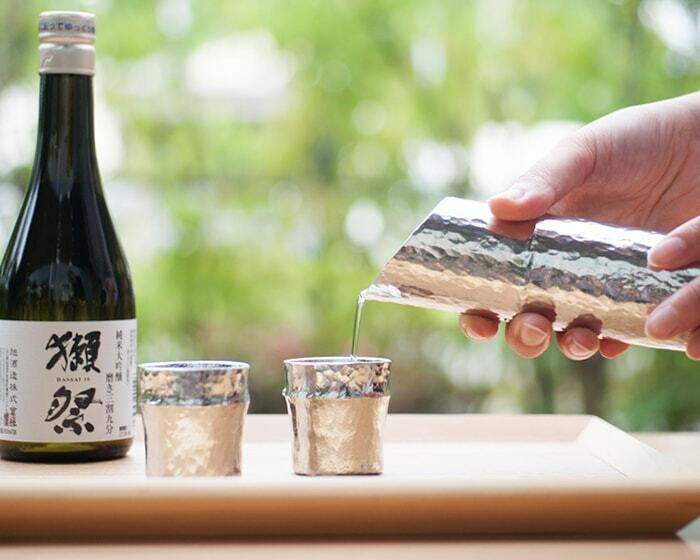 When you have the Nousaku sake set, you can feel the elegance from the shine. Beautiful gloss, unique texture, stylish and elegant mood are the fascination of tin. 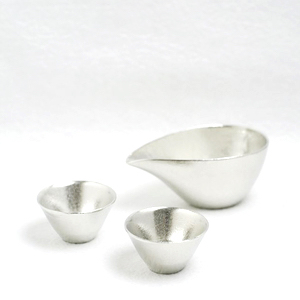 Please enjoy every bit of the fascination of tin sake cups with your hand and taste. 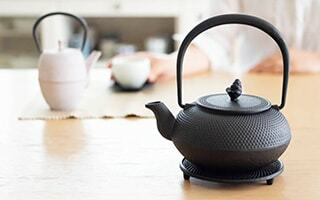 Is tin tableware safe? How to care them? 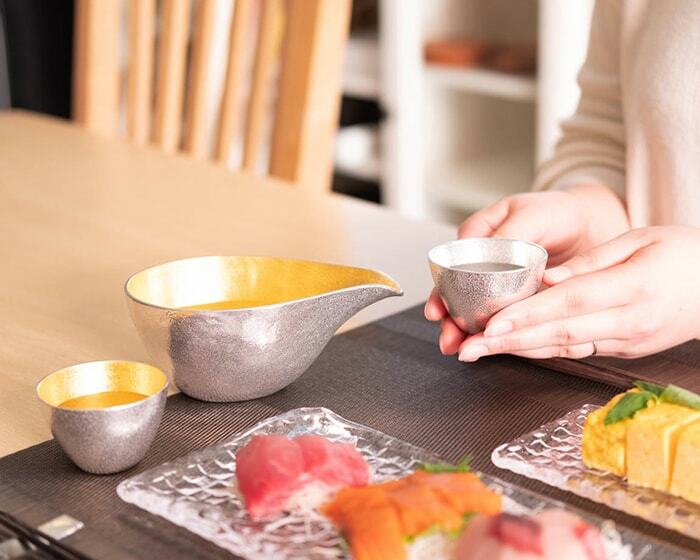 You may not so familiar with metal tableware or sake set. In fact, tin is hard to cause metal allergy. It is harmless to human body. Please use the tin sake sets at ease. Also, tin has high acid resistance. 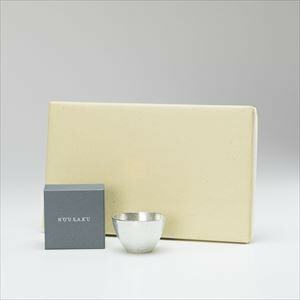 Tin cup is not oxidized into black like silver. 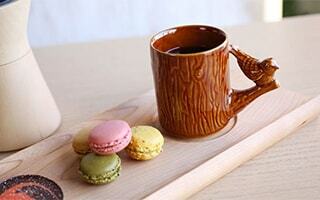 You can care the tin sake sets just as same as usual tableware. Furthermore, Nousaku sake sets are hard to be broken. You can send the tin items for faraway places at ease. 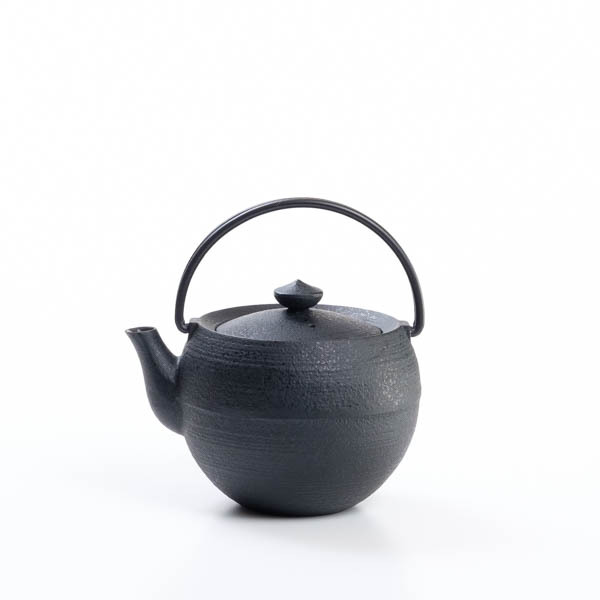 Tin sake sets have high thermal conductivity. When you refrigerate the tin sake cups for 2-3 minutes, you can enjoy colder sake. Of course, you can enjoy sake at the normal temperature. Nousaku sake sets keep best temperature of sake. If you would like to enjoy hot sake, be careful. The tin sake cups become hot, too. We recommend drinking warm sake at most. 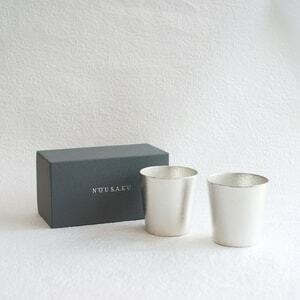 For your daily drink, entertaining guests, or home parties, tin sake cups work in various scenes. 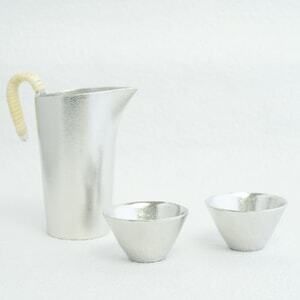 Chic tin sake sets can make stylish table setting. 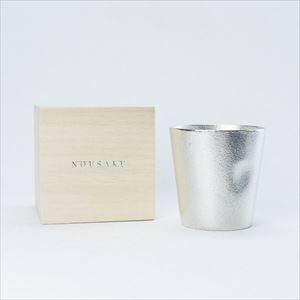 For all alcohol lovers, Nousaku sake sets are indispensable items! 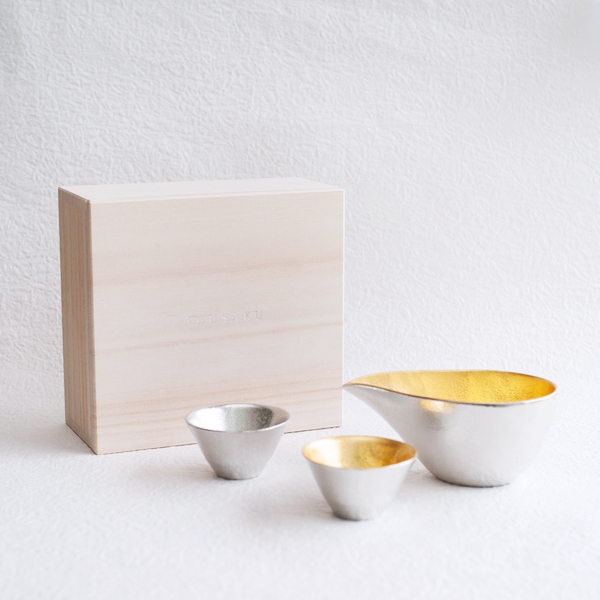 Japan Design Store offers various tin sake sets and sake cups of Nousaku. 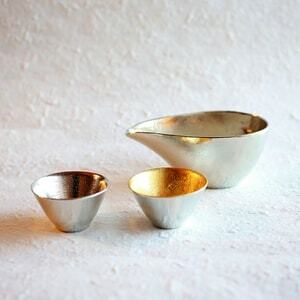 Nousaku is a casting studio of tin and brass. 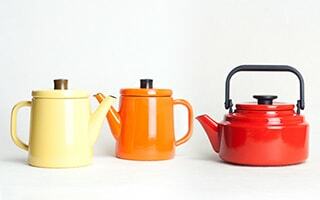 It has 400 years’ history of Takaoka copperware. Many tin or brass items with modern design have been popular. 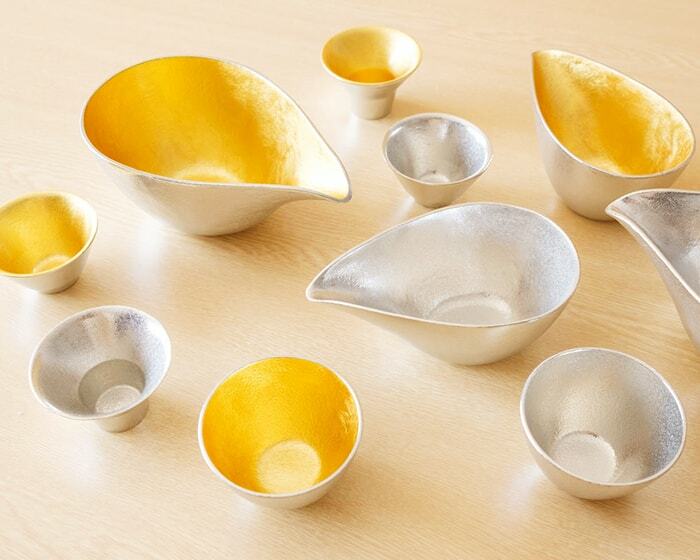 Now, the items of Nousaku have fascinated the people around the world as artwork than a traditional craft. 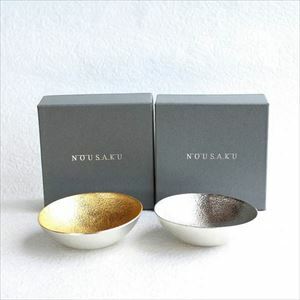 All tin items of Nousaku are handcrafted. The more you use, the more you love the tin items. Beautiful gloss of 100% pure tin captivates you anytime. 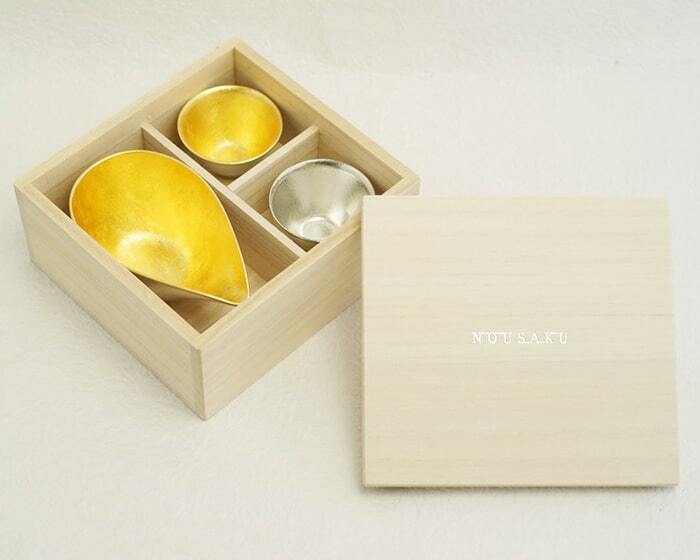 “Bamboo sake set” of Nousaku is a high-class sake set. 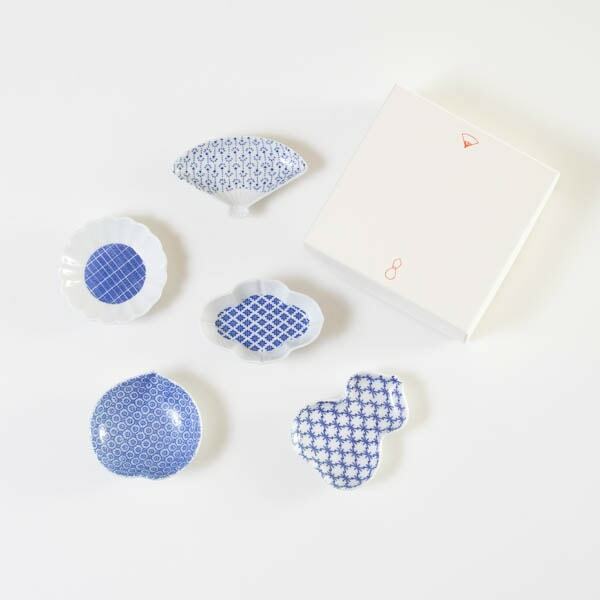 This Nousaku sake set is produces by Kimio Nonaga, a Chief chef of a Japanese-style restaurant “Nihonbashi Yukari.” A craftsman, Kenji Mizumaki does the finishing of this gorgeous sake set. No other craftsmen can make this beautiful tsuchime, a pattern on the surface by pounding with hummer many times. 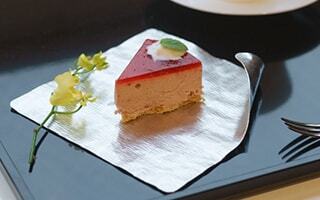 Please enjoy the atmosphere of high-class Japanese restaurants on your dinner table. 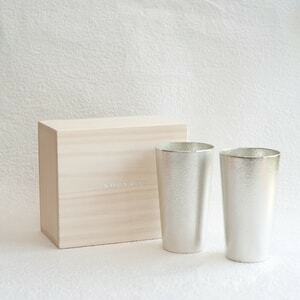 [Nousaku] Bamboo sake set and guinomi bamboo has stylish, chic, and luxury atmosphere. Balanced weight and form would fit your hands. You can feel Japanese culture from them. Recommended item for special gifts! Nousaku sake set “FUTAE” is a pair set of sake cups. 2 different form cups can be nested inside another cup. So, it is easy to bring anywhere. 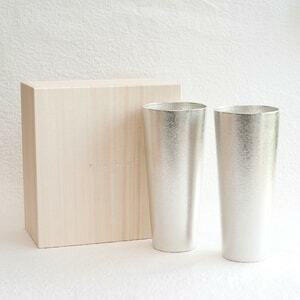 Sake set of pair sake cups would be great gift for sake lovers’ couples. [Nousaku] FUTAE is a pair sake bowls. One cup can be nested inside another cup. FUTAE looks like a couple. 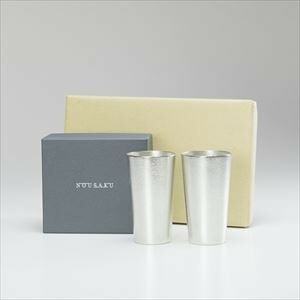 So, it is great item as wedding gifts. Also, compact sake cups are useful when you go on a trip. 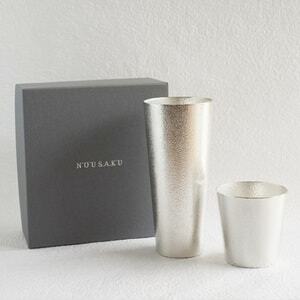 If you would like to drink beer with Nousaku sake set, we recommend this beer cup and tumbler! 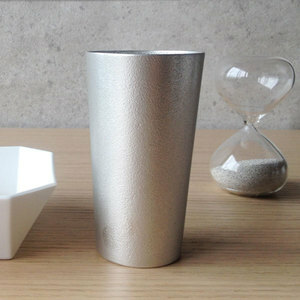 Especially for hot day, refrigerated tin beer cup or tumbler for 2-3 minutes before drinking. You can enjoy coolest beer! 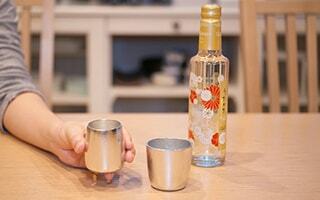 Of course, tin beer cup and tumbler are good with Japanese sake or shochu as well. 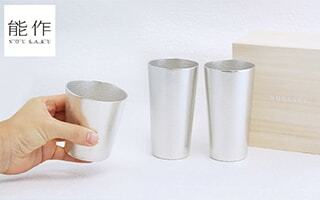 [Nousaku] Tin beer tumbler and beer cup make beer delicious! 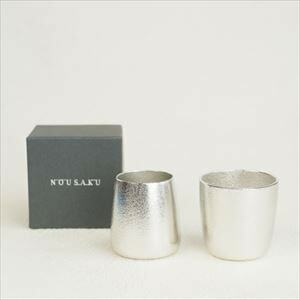 Your drinking time will be more special with this tin beer tumbler and beer mug of Nousaku. 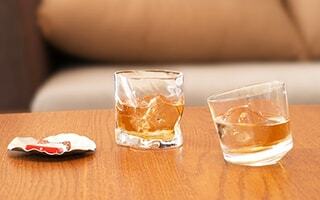 When you would like to enjoy Japanese sake in a calm mood, we recommend Nousaku sake set with Katakuchi and guinomi. Katakuchi is a sake pitcher and guinomi is a small sake cup. 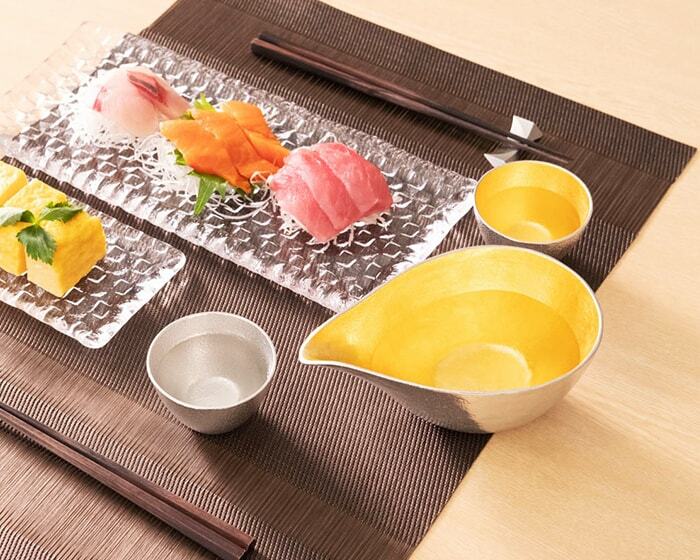 Your dinner time becomes more elegant and gorgeous with the sake set. 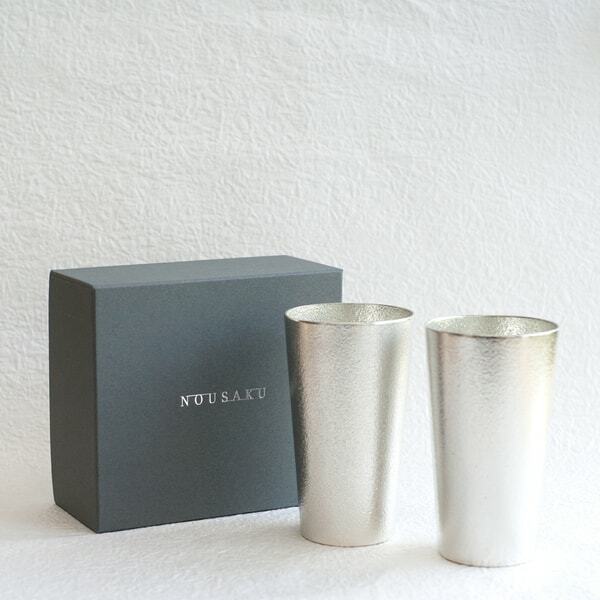 High-class sake set of Nousaku is a great gift for your dearest person, too. 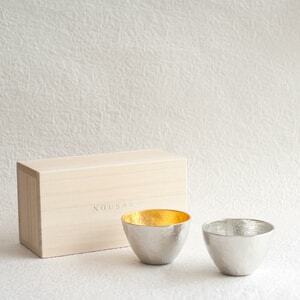 [Nousaku] Tin sake cup makes your sake more delicious! You can color your dinner table with these colorful sake tools. Various sake tools are also nice Japanese gift. 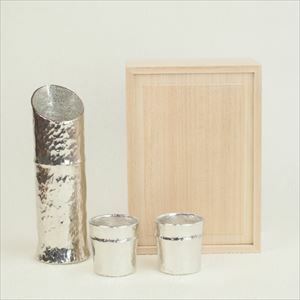 If you are interested in tin sake sets, how about tin plate “suzugami” from syouryu? 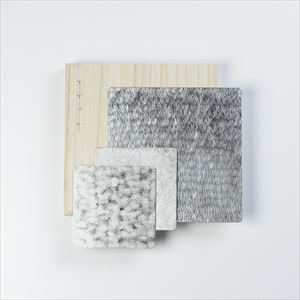 Various kinds of Japanese media have introduced this suzugami. The most unique point of suzugami is its flexibility. 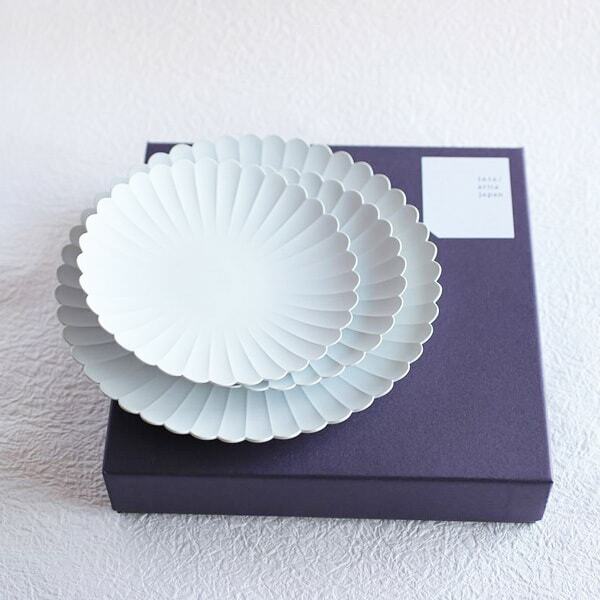 You can bend a plate into your favorite form. As a platter, you can put some cheese or sashimi. 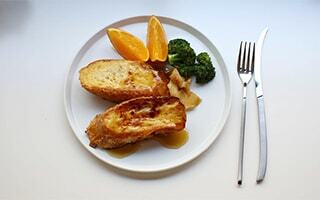 When you make a bowl with suzugami, you can put some juicy foods such as stewed food. 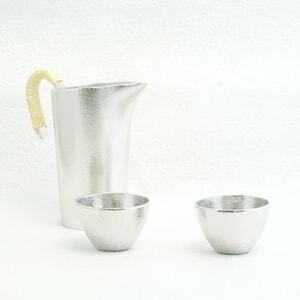 Your sake time will be more stylish with Nousaku sake set and suzugami. 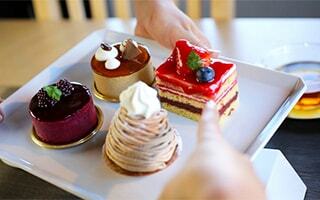 Suzugami can make usual food look elegant. When you have guests, suzugami entertains them. Your guests may be surprised at the unique tin plates. Suzugami have been popular for gifts for a long time. How about sending Nousaku sake set with suzugami? [syouryu] Suzugami is made of tin. This metal tableware, however, can bend easily. Japanese media picks up this magical plate many times. Please touch and bend suzugami. 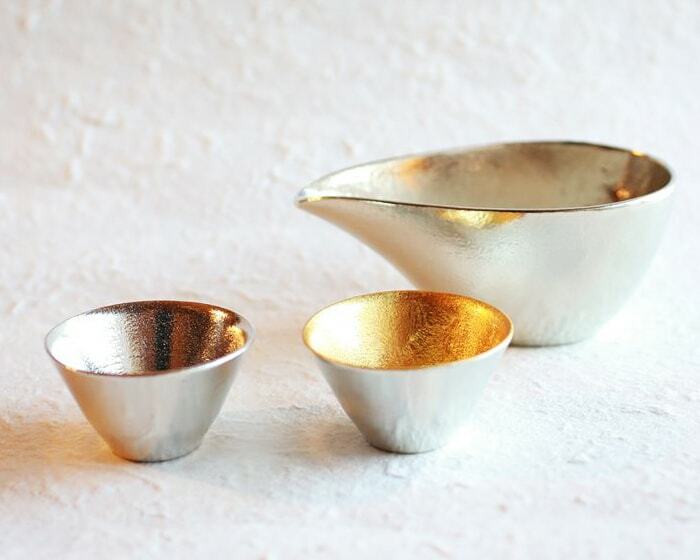 We believe that you are fascinated by this tin tableware. Japan Design Store prepares Japanese modern gift wrapping. 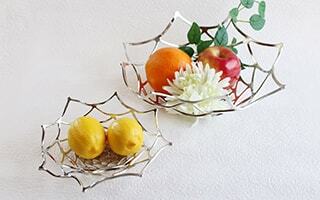 It is suitable as Japanese handcrafts. 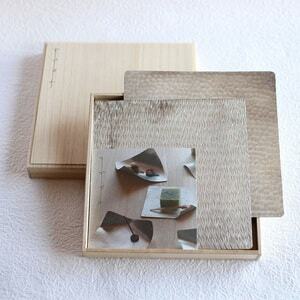 Some items have exclusive boxes or paulownia boxes. They have got great reputations. 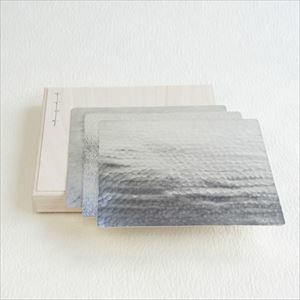 If you choose USD $3 gift wrapping, you can change usual Mizuhiki into “Japanese Ume-Mizuhiki” for USD $1. The knot of Ume (Plum) has the meaning of “strong bond”, “talisman”, or “good fortune.” It is suitable for celebrating someone. 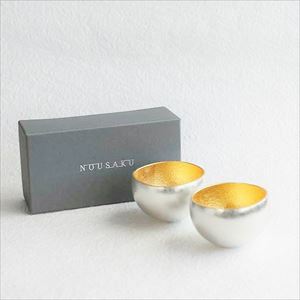 How about sending elegant and cute Japanese Ume-Mizuhiki as gift wrapping? 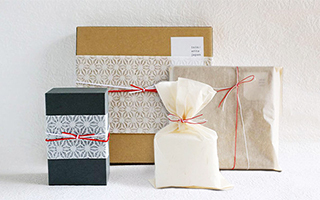 Japan Design Store offers various elegant gift wrappings for your important gifts. Please select your favorite gift wrapping from $1 or $3 wrapping. 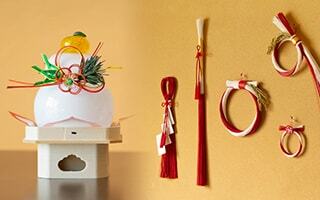 Cute Japanese Ume-Mizuhiki and Message card service have been popular. 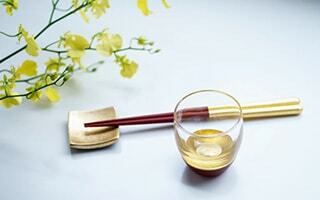 In addition to the items above, we offer “Chirori” for hot sake, or beautiful sakazuki cup “Kuzushi” and more. 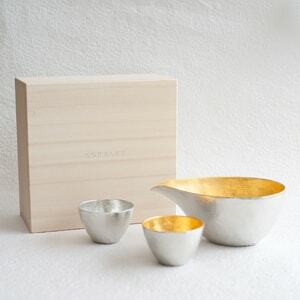 Nousaku sake sets and sake cups entertain you with their design and effects to make sake delicious. 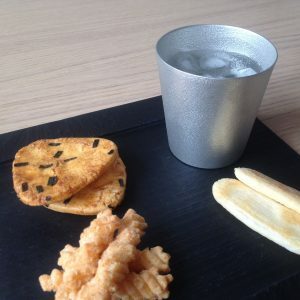 Please enjoy special sake time with Nousaku sake sets. 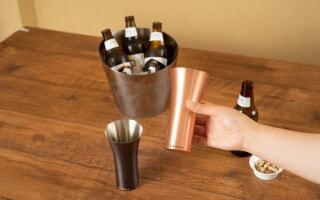 Enjoy fall beer with tin beer cup! Enjoy foods in season with tin tumbler!